The Chittagong Hill Tracts (CHT) consist of 3 districts in the southeastern part of Bangladesh- Khagrachari, Banderban and Rangamati. Half of Bangladesh’s populations are tribal people with the other half being mainstream Bengali. There are 12 ethnic groups, the Chakma, Marma, Tripura, Mrung, Tanchangya, Bawm, Chak, Pangkhua, Lushai, Khyang, Khumi and Rakhain, with the largest amongst them being the Chakma tribe. Ethnic and religious differences are what separate the tribal people of the CHT from the Bengali population. This combined with the governments national assimilation programs and the ongoing settlement of Bengali people on the customary territory of tribal peoples, is the cause for ongoing conflict in this region. Pre-colonial- Before Colonial presence in the CHT, there were three traditional chiefdoms, Chakma, Bomang and Mong rajas, that extended their rules over the CHT. These traditional and institutional structures unique to the CHT, were responsible for natural resource management and the collection of taxes. In addition to this, the rajas were responsible for carrying out social and cultural practices that reinforced ancestral, customary and traditional relationships between the community and the land. 1857-1947- The British Crown administered control over the hills of Chittagong, classifying them as a subdivision in 1860, for the purpose of tax collection. Over time, more and more land was converted to Reserve Forests and state regulations over these forests tightened. Like with village dwellers in West Bengal in India, the preexisting rights and relationship that tribal peoples had to these forests were ignored. Restricting tribal peoples access to these forests and their resources had a detrimental impact on their livelihoods. Meanwhile, these forests were exploited by the Revenue Department of the British Government, for raw materials needed in the shipping and railway industries. 1947-1971- 1947 marked India and Pakistan's Independence from British Rule. Bangladesh came under East Pakistan. In 1962 a dam was built on the Karnafuli River with the help of USAID, to generate electricity as part of the Kaptai Hydroelectric project.This led to the inundation and loss of land and livelihoods for 100,000 tribal people who moved to other parts of the Hill Tracts or into the surrounding states of India. State exploitation of forests for their commercial and industrial benefits continued in this post- colonial period. 1971- Bangladesh gained Independence from Pakistan in 1971. An activist group called Parbatya Chattagram Jana Samhati Samiti (PCJSS), representing the voices and concerns of the people in the CHT, felt the moment was ripe to demand for a separate state for the people of the CHT. Tensions escalated in the region and after four years of violent conflict between the armed component of the PCJSS and the Bangladeshi military, a Peace Accord was signed.The signing of the Peace Accord in 1997, reduced violence against tribal people in this region and opened it up to NGOs, international development organizations and Government programs. Tenure arrangements in the CHT are different from the rest of the country as they allow for customary and formal administration of land to exist side by side. The practice of Jhum or shifting cultivation is a key reason for complex tenure arrangements in this area. Historically, De facto ownership meant that property was held in common, with systems in place to determine who had ownership and access to areas in the CHT for settlement and cultivation. Since rights to the forest were held in common we can say that there was equal access for community members to the local forest, as well as excludability to outsiders. Local headmen enforced customary rules and guidelines with regards to access to forest products, harvesting techniques and distribution of land. The practice of Jhum cultivation called for the migratory movement of people across the hillside. This combined with the lack of a legal framework meant that people did not claim land in this region. Currently there is a De jure arrangement. A third of the population -mainly Bengali people- in the CHT have registered private property rights that allow them to have access to and ownership of the land they are on. Only 25% of all Indigenous people, half of the Chakma population has legal ownership of land in the CHT. The other types of tenure include customary recorded and unrecorded common property. A large number of tribal people have customary recorded rights, more so than Bengalee people. In total 90% of population in the CHT has access to land in some form (legal, customary recorded and unrecorded common property). As is the case in other parts of the world, the secure tenure rights of tribal people in the CHT have not been fully recognized and addressed by the Bangladeshi nation state that has imposed its statutory laws over customary territories. This makes the tribal people of the CHT particularly susceptible to land grabbing and fraudulent dealings. It is necessary that tenure is made secure for these communities, to ensure food security and their continued participation in sustainable forest management. During the early period of colonial rule, 3/4th of the land in the CHT was declared as government forestland, with 1/2 of the land kept aside as fallow (khas land) and reserve forests, to which no one was given access or ownership rights to. These policies highlight the states role in the alienation of tribal people from their traditional land and resources in the name of national development and the "common good". The rest of these forests were classified as unclassed forests whose use was regulated under district administration. Two types of administration structures exist in the CHT a customary structure and a government administrated structure existing at the local, regional and national level. The customary structure involves the division of the CHT region into three taxation spheres, each headed by a king who determines the revenue, forestry rules for harvesting timber and NTFPs and clearing and burning activities for each circle. Headmen control land distribution, collect revenue for the chief from mauzas (smaller administrative units) from a number of villages and also support villagers in getting access to legal documents for permanent ownership. A karbari from each village assists the headman in collecting revenue. The CHT Manual of 1900 guarantees the formal functions of these circles, with this form of administration coinciding with the district governments administration. 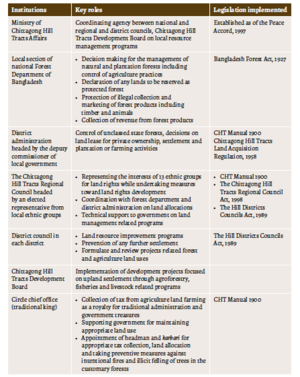 The Ministry of Chittagong Hill Tracts Affairs, The local section of the National Forest Department of Bangladesh, the District Administration ,the Chittagong Hill Tracts Regional Council, the District council and the Chittagong Hill Tracts Development Board are are government funded organizations, with different mandates, working towards the social,economic,political and environmental resiliency of the Chittagong Hill Tracts. The image on the right explains the key roles of these different agencies who along with the Circle chief office are responsible for governance in this region. The affected stakeholders in this case study are the tribal people of the CHT and in particular the Chakma community, the largest ethnic group. This forest dwelling community is highly dependent on the forest for food security and livelihoods. The main source of household income is from shifting agriculture (68%), with incomes from selling forest products in local markets, such as fuel wood, timber, wild vegetables, fruits, and other forest products, coming in second. In addition to being dependent on the forest for its resource base, the Chakma community as well as other tribal groups like the Marma, also have a spiritual connection to these forests. Local healers treat a variety of sicknesses from common colds to polio, using remedies made from different plants found in local forest commons. Therefore it can be said that the lives of the Chakma community are intertwined with the local forests they use. Recognition of this relationship calls for the inclusion of the Chakma tribal community in the management of their local forests. The success of afforestation programs in social forestry programs like Village Commons Forest, are because of community participation, attesting to the need for local people to "buy into" external initiatives aimed at forest resilience. Different non-local groups represent various interests and seek to impose their own management regimes over the land of the CHT and its people. At a local level this includes the workings of different governmental organizations. The district administration headed by the deputy commissioner plays an essential role in permitting access to land for local ethnic, displaced and poor people. He has special power (according to the CHT Manual 1900) to follow the traditional structure of land distribution, particularly when it comes to tribal access to “unclassed state forest” management. Another key stakeholder is the Chittagong Hill Tracts Development Board. This autonomous agency has implemented resettlement programs that support the relocation of poor people from the Bengalee community into the CHT in a bid to improve their economic wellbeing. In the 1980s it also undertook a resettlement program for shifting cultivators that was considered a disappointment by local ethnic people. Under the Peace Accord of 1997, the Chittagong Hill Tracts Regional Council's role is to supervise and coordinate activities of different agencies in the region. Similar to the role of the president of the Rural Council in the case study about Senegal, the chairman of this council represents the interests of all the ethnic people in three districts and any development activity in the region requires his/her approval before implementation. However, the institutional and financial capacity of the regional council is considered insufficient to date and therefore is an example of a a type of slippage in governance in this region. International organizations working for human development (United Nations Development Project) and biodiversity conservation (USAID) are two examples of international organizations working in the CHT. While the Kaptali dam and protected area management programs of USAID can both be considered failures in supporting tribal people ( one for destroying biodiversity and the other for restricting local access to forests even further) the United Nations Development Project has successfully worked as an intermediary organization, creating space and encouraging collaborations between representatives from tribal communities and local government representatives. Therefore they play an important role in co-ordinating the activities of different stakeholders in this region. What makes this case study interesting is that there are multiple layers of colonization that have impacted these forests and its tribal people. According to Charles Menzies "(States) have demarcated boundaries to bring into existence an administrative category of land known as ‘forest’, created agencies to implement preferred management regimes on that land, and policed the forest to exclude and punish offenders against the declared public interest." When we consider the history of forests in the Chittagong Hill Tracts since the British Colonial period, it is evident that these forests have been racialized thereby marking them as geopolitical forest as much as biophysical ones. Holding land in forest commons has been the way that these forest dwelling communities have survived over the years. Increases in private property rights and plantation leases to Bengali settlers in the CHT, is a threat to the customary rights to forest commons, that are not protected by the current legal framework. It appears that the people of the CHT are like the Saami in that they are not necessarily looking for land ownership but a way for them to continue to have use rights to the forest, on which they continue to practice shifting cultivation. For most tribal people, the holding of land in common is one way of them maintaining their distinct identity from the Bengali population in the CHT. If receiving individual property rights is the only viable solution for securing tenure in this region, it will force tribal people to assimilate to colonial ways, rather than forcing governments to create frameworks needed to fully recognize and accomodate customary common property ownership in the CHT. The imposition of arbitrary demarcations of the land as reserved, unclassed or khas forests and the increase of state control over forests over the 20th century has detrimentally impacted tribal people. These policies had a major impact on the basic social, cultural and economic rights of indigenous people.The stopping of subsistence activities because they took place in "prohibited areas", without the provision of alternative avenues for income generation gave indigenous people no alternative but to enter reserved forests to use and extract resources. This marked them as illegal squatters and robbers of forest resources, increasing tensions with settlers and forest service agencies. With these realities in mind we can say that "Forest management in the CHT is an example of the alienation of land and forests from indigenous people and the transfer of resources from poor to rich, local to outsider, periphery to center”. Even though there is no longer a violent conflict in the Chittagong Hill Tracts there are still tensions that exist between tribal people and the State Forestry Department. Tribal communities have been deeply affected by changes implemented on their forest dwelling communities by settlers. The building of the Kaptai hydroelectric dam, led to the inundation of the Karnafuli lake which led to the mass migration of tribal peoples away from their customary territories, marking a loss to both land and livelihoods. Projects must take into consideration the impacts( or unintended consequences) on local communities if they are to be successful. Another element is the blaming of local people for forest degradation in the Chittagong Hill Tracts due to the practice of slash and burn agriculture. This fails to account for the years of colonial exploitation of these forests during British,Pakistani and Bangladeshi rule. It is important to remember that the CHT was never considered a resource to be managed and used based on ecological, biological and social principles. It was seen merely a resource to be exploited, which has led to the poor management of these forests, a cause of resource depletion and natural degradation. Finally, comparing Protected Area management ( a collaboration between USAID and the Forest Department) to Village Common Forests (VCF) indicates the central role that local people play in forest governance. Protected Area management came in the way of local people asserting their rights to forests. While distrust was sown through Protected Area Management projects, Village Common Forests empowered local people to play an active role in forest governance. This honored the Traditional Ecological Knowledge of the Chakma community and helped reduce distrust and conflict between forestry officials and local peoples, while also succeeding in reaching the projects objective- a reduction in the rates of deforestation. Replicating the VCF management model has the potential to increase the power of local communities and help ease area-specific tensions between local communities and the governments, as it did here. Indigenous people are highly dependent on these forests for income and subsistence living. It is therefore important to honor their customary rights to these forests through consultations and by equipping them with the skills and technology needed to effectively and sustainably manage their forest homes. Based on the literature review I did for this assignment, I recommend that the tribal people of the CHT be included as collaborators in the research process, rather than just as research subjects. This honors the individual voices and agency of different members from various communities. This case study relied heavily on journal articles and government documents written by scholars, government officials and Aid agencies. Community forestry sets local people as the experts of their local forests and privileging the sharing of knowledge from their perspective is important in how research is done. The decriminalization of marginal forest dwellers using forest resources in reserve forests is an important step towards recognizing the ancestral, traditional and customary rights of tribal people to the forests in the CHT. Reserve forests should not be expanded and instead turned over to local communities over time. Equipping local communities is the only method for the sustainable management of these forests. It is evident that this community lacks the resources to navigate access to secure tenure rights. Interested stakeholders like the government and NGOs should put an end to issuing private leases and licenses to Bengali settlers and instead provide them to members of tribal communities who desire them instead. In a consultation between members of the United Nations Development Project, community members of three hill districts and Forest Department officials, tribal people requested that the Land Commission established to settle disputes in the CHT be activated.This is key in recognizing the traditional rights of indigenous people over communal land and forests and would play a key role in securing tenure rights for tribal people in the CHT. Initiatives should be taken to create employment in this region and people should be made aware of development initiatives within their area, which will help ease their dependence on forest resources. ↑ 1.001.011.021.031.041.051.061.071.081.091.10 Ahammad, Ronju, and Natasha Stacey. "Forest and agrarian change in the Chittagong Hill Tracts region of Bangladesh." Agrarian change in tropical landscapes (2016): 202. ↑ 2.02.12.2 Rasul, Golam. "Political ecology of the degradation of forest commons in the Chittagong Hill Tracts of Bangladesh." Environmental Conservation 34, no. 2 (2007): 153-163. ↑ Khan, Mamunul, M. Aziz, M. Uddin, S. Saif, S. Chowdhury, S. Chakma, G. Chowdhury et al. "Community conserved areas in Chittagong Hill Tracts of Bangladesh." (2012). ↑ Rasul, Golam, and Gopal B. Thapa. "Financial and economic suitability of agroforestry as an alternative to shifting cultivation: The case of the Chittagong Hill Tracts, Bangladesh." Agricultural Systems 91, no. 1-2 (2006): 29-50. ↑ Shelly, Mizanur Rahman. The Chittagong Hill Tracts of Bangladesh: The Untold Story. Centre for Development Research, Bangladesh, 1992. ↑ Khan, F. M. A., and S. Mantel. Planning for improved natural resources management: pilot study in Bandarban Sadar Upazilla. No. 8. 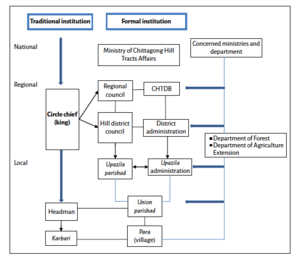 Chittagong Hill Tracts Improved Natural Resources Management, 2007. ↑ Roy, Raja Devasish. "Country technical notes on indigenous peoples’ issues: People’s Republic of Bangladesh." IFAD Country Report (2012). ↑ 8.08.18.2 Barkat, Abul, Sadeka Halim, Avijit Poddar, Md Badiuzzaman, Asmar Osman, M. S. Khan, Matiur Rahman et al. "Socio-economic baseline survey of Chittagong Hill Tracts." Dhaka: United Nations Development Programme (UNDP) (2009). ↑ Bala, B. K., S. Majumder, SM Altaf Hossain, M. A. Haque, and M. A. Hossain. "Exploring development strategies of agricultural systems of Hill Tracts of Chittagong in Bangladesh." Environment, development and sustainability15, no. 4 (2013): 949-966. ↑ Jashimuddin, Mohammed, and Makoto Inoue. "Management of village common forests in the Chittagong Hill Tracts of Bangladesh: historical background and current issues in terms of sustainability." Open Journal of Forestry 2, no. 3 (2012): 121. ↑ 11.011.111.2 Islam, S. M., M. Alam, and S. Mantel. Land use planning and environmental control in the Chittagong Hill Tracts. No. 3. Bangladesh Centre for Advanced Studies, 2007. ↑ Miah, Danesh, Sheeladitya Chakma, Masao Koike, and Nur Muhammed. "Contribution of forests to the livelihood of the Chakma community in the Chittagong Hill Tracts of Bangladesh." Journal of forest research 17, no. 6 (2012): 449-457. ↑ Raymundo, Ma Concepcion Y. "Indigenous knowledge and Learning in Asia, Pacific and Africa: Perspectives on development, education and culture" Dip Kapoor and Edward Shiza (Editors), 2010. New York: Palgrave Macmillan, 274 pp." The Normal Lights 8, no. 1 (2015). ↑ Khisha, Tuhin, Reatul Karim, Sharmin Reza Chowdhury, and Rebecca Banoo. "Ethnomedical studies of Chakma communities of Chittagong Hill Tracts, Bangladesh." Bangladesh Pharmaceutical Journal 15, no. 1 (2012): 59-67. ↑ 15.015.115.2 Jashimuddin, M., and M. Inoue. "Community forestry for sustainable forest management: Experiences from Bangladesh and policy recommendations." Formath 11 (2012): 133-166. ↑ Menzies, Nicholas K. Our forest, your ecosystem, their timber: communities, conservation, and the state in community-based forest management. Columbia University Press, 2007. ↑ Rashid, AZM Manzoor, Donna Craig, Sharif Ahmed Mukul, and Niaz Ahmed Khan. "A journey towards shared governance: status and prospects for collaborative management in the protected areas of Bangladesh." Journal of forestry Research 24, no. 3 (2013): 599-605. ↑ United Nations Development Project, Chittagong Hill Tracts Development Fund, Forests in the Chittagong Hill Tracts: Local Issues and Potential Approaches. 2011.